With so much blood and gore, you may wonder what’s so “Happy” about this racing game. There’s always a fear of losing a limb or a head, getting blown up by a hidden mine or being smashed by a falling object. It’s definitely not your typical racing game because at the end of each race you will always feel you have survived a level when you reach the finish line. There’s death on every corner and even a harmless-looking flip can decapitate your character. Tap and then hold down on a part of your screen to start moving. Holding down the screen will also increase the vehicle’s speed. You will also have to tap the left or right side of your screen to maneuver your vehicle backward and forward. Besides tap-based controls, the game also takes advantage of your phone’s gyroscope to help you avoid obstacles and land safely. You can either tilt your phone left side or right side to make your character sway in that direction, or just rotate the screen for a 360-degree flip to jump over obstacles like fire, spikes etc. On a flat track, do not tilt your phone too much, else your character will hit the ground and lose a leg. Tilt your mobile carefully when your character is jumping from one platform to another as extreme tilting can also smash his head against the ground or dismantle a wheel. You won’t be able to move if a wheel gets dislodged from a vehicle, and you will have to start the game again. Be careful when maneuvering lightweight vehicles. Such vehicles can easily turn upside down even if you tilt your smartphone slightly. Accidents are inevitable in Happy Racing, and losing a limb or two is quite a common sight, thanks to so many obstacles. Your character will bleed profusely, but that should not stop you from moving forward. However, if he/she loses a head, then it’s probably game over. When you lose a head, a bar will pop up in the middle of the screen and will reduce pretty fast. You can still win a level if you lose a limb, but chances of hitting the finishing line are less if you lose a head in the middle of a level. Do remember that it’s a race against time and so you will have to move pretty fast and reach the end to get at least 2 stars. You will still be able to continue moving even though your character has lost a limb. You may go through fire, but don’t panic. Maybe the finishing line is pretty close and if you maintain a good speed, you may reach the end in no time Concentrate more on moving your vehicle and avoid losing your head. Your goal is to reach the finishing line overcoming all obstacles. It’s all about gaining momentum on difficult tracks so increase your vehicle’s speed by holding down a part of the screen when moving over falling platforms or moving on huge winding tracks. To reach a new level pack, earn the required number of stars mentioned at the bottom of each pack. You can easily sail through a new level pack by earning a total of 22 stars/24 stars. The game is all about beating time to earn three stars, so essentially it is a race against time, and not against any opponent. The quicker you reach your destination, the more stars you will earn. The time bar at the top of the screen keeps decreasing and when reduces completely, a star disappears. The time bar resets and keeps decreasing once again. Once it reaches 0, the second star vanishes. You should reach the finishing line before all stars disappear one by one. You may not succeed in your first attempt, and that’s very understandable considering that each level has a unique design, and has dangerous obstacles, bombs, spiky floors and fire. Levels with crumbling platforms and winding tracks won’t be easy to complete. When you start a level for the first time, take it lightly, and treat it as a practice level. Move around exploring the level. This will give you a clear idea about tracks, obstacles and platforms. You can then play the same level again with much more confidence. Also, keep an eye on on-screen prompts (arrows etc.). They will tell you where you should be moving and when you should tilt your phone to do a front/back/360-degree flip. Spend coins to get new characters. Earning coins is pretty easy. Look for “Free Chest” at the top-left corner of your home screen. You will receive coins for every star earned, plus there are chests that can be unlocked after each level. Sometimes, you will have to watch a video to open the free chest. Opening the chest will allow you to play the roulette mini-game. Just tap at the right moment to get the best rewards. If you are lucky, you may get a new character. You may even unlock a few characters by playing the game daily. 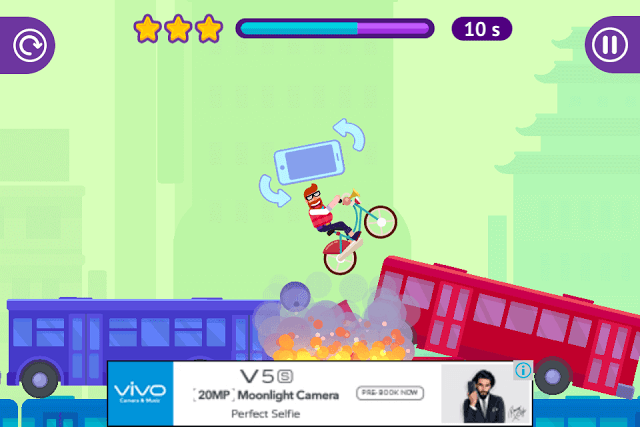 While playing, your will receive bonus coins for some stunts such as forward flip, 180 degree flip, back flip etc. Can’t complete a Happy Racing level? Select a different character from the list. Tap the “Characters” button located at the lower-left corner of the screen. Each character has a unique ability, which can be seen by tapping the tiny “i” button at the top-right corner of a card. Tap it and the card will flip, showing you his/her key abilities. Some characters may rotate easily or may have lightweight vehicles that would easily flip when moving over obstacles, whereas others have large-sized vehicles that can easily move over large obstacles, thereby avoiding delays on small bumps. The game also provides character recommendations based on level difficulty. When you fail in the first attempt, have a look at the bottom-right corner of the screen to see what character the game recommends. It will even let you try a new character for that particular level for free, but you will have to watch a video soon after completing a level with the recommended character.